Given the lack of a useful cartobibliography for post-Revolutionary War maps of North Carolina, one shouldn’t be too surprised to find a previously unrecorded map. Nonetheless, the recent discovery of a previously unknown first state of an 1814 map of North Carolina generated some excitement from this blogger. Mathew Carey published his first General Atlas in 1795. The map of North Carolina contained therein remained unchanged until 1814 when not one, but two maps of North Carolina were engraved. 2nd state – Anson and Rutherford counties named; Craven County now correctly spelled (1817 and 1818 atlases). 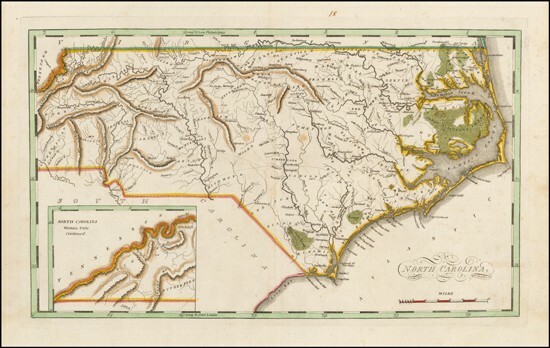 Let’s focus on Carey’s first 1814 map of North Carolina. The title cartouche includes imprints for the cartographer (Samuel Lewis), and the engraver (William Charles). Unlike all previously known copies of this map, the recently discovered first state lacks any engraved county boundaries. As of the most recent update, four copies of the first state have now surfaced, three having been removed from atlases, and one within an intact atlas (Roger Baskes Collection). Image courtesy of Barry Lawrence Ruderman. When the plate was revised by the addition of county boundaries, a number of county place names had to be re-engraved to fit in their respective county’s borders. In some cases, incomplete erasures offer proof that the two maps were printed from the same plate. For example, the first state of the plate shows ROBESON curving gently towards the east (below, left). On the second state of the map, the SON of ROBESON had to be re-engraved on a northerly curve to fit within the county boundary. One can see faint remnants of the original S and O straddling the Robeson/Bladen county line (below right, red arrows). Franklin and Sampson county place names had to be hyphenated to fit within their respective counties on the 2nd state. On the original engraved plate, the final N of Franklin was wedged in the fork of a stream (below, top image). When modifying the plate, the engraver left significant portions of this “N” on the updated map (below, bottom image, red arrow). How many additional engraving corrections or erasures can you spot? Any additional information, comments, or corrections would be greatly appreciated. Please use the “What’s on your mind?” comment box below. Many thanks to Roger Baskes, Dave Morgan, Ashley Baynton-Williams, and Barry Ruderman for providing information and/or images. To see other maps that have been “Re-stated” on the North Carolina Map Blog, click here. This entry was posted in 19th Century, Boundaries, Cartobibliography, Map errors and tagged mathew carey, north carolina maps, Re-stating, samuel lewis, william charles by crmaps. Bookmark the permalink. Remarkable! As you say, seemingly a proof state pulled in the course of engraving the plate — but how did it survive? And why would county names be engraved before county boundaries? — you’d think a sensible engraver would start with the boundaries and then fit in the names. The example shown above, and another example that just appeared on a dealer’s web site, both have binders tabs on the verso. The latter also has a manuscript “18” in the top center margin. (The second state has an engraved “18” in top right corner.) Therefore, the first state apparently was not simply a “proof” state, but a production copy. The plate must have been revised very early in production, given the fact that the first state of the map remained unknown until very recently. Note: Blog post revised on 1/16/2016 to reflect new information that has been provided. Blot post revised on 4/10/2016 to reflect another copy that has surfaced (now 4 total, multiplying like rabbits).